All cheddars aren’t created equal, and in this recipe, you want as sharp as you can get it. Sharp cheeses are good in that you can use less cheese to impart flavor, saving you calories in the process. I use a good artisinal cheddar, but in a pinch, you could grab some Cracker Barrel Vermont Sharp White Cheddar and go from there. If you want to have quiche night (as we used to have when I was a kid and Dad wanted to rock the CuisineArt for the night), make the Quiche Lorraine at the same time. You’ll be pleasing the meat eaters and the veggie eaters all at the same time. Preheat your oven to 400°. Grease a 9 x 3 in. round cake pan and press the pie crust into the pan, forming high sides. Heat a skillet and add olive oil. When hot, add your baby spinach, along with a pinch of salt, pepper and nutmeg. Cook until leaves are wilted and bright green. Remove leaves from the pan and set aside. When spinach cools a bit, squeeze water out and chop loosely. In the skillet, melt the butter and add the mushrooms. Allow to brown on one side and then stir in the shallots, salt, white pepper, and pinch of nutmeg. Cook mushrooms until soft and liquid begins to evaporate. Let cool slightly. In the cake pan, sprinkle half of the cheddar on the bottom of the crust and then top with 2/3 of the spinach. Top with the mushrooms. In a medium-sized bowl, beat the eggs, cream, salt, white pepper, nutmeg and one third of the spinach until blended – do not overmix or your quiche will blow up into a weird soufflé. Pour egg mixture into the pan and top with the rest of the cheddar. Bake for 40 minutes until the middle of the quiche is set and no longer wiggly, and the top is lightly browned. Let rest for 5 minutes and then slice and serve. Dear Angela – Your quiche especially your crust is amazing. 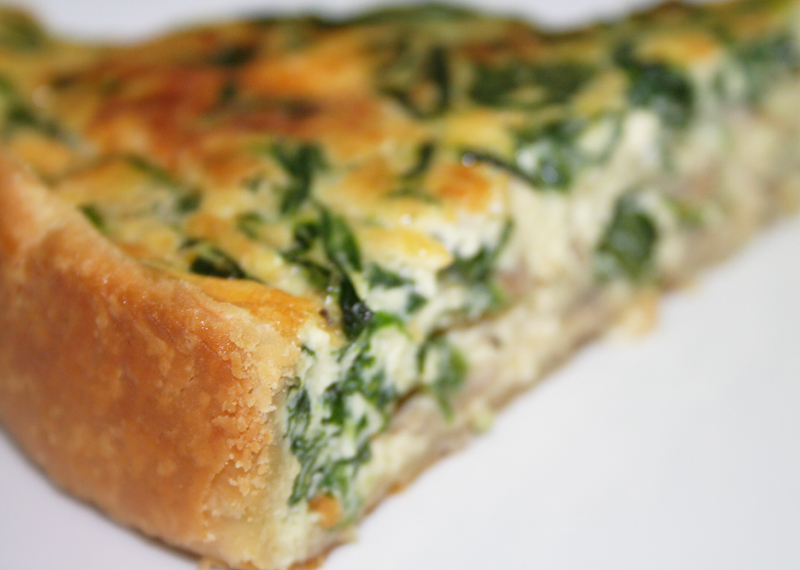 I love the flavors of a Florentine quiche — perfect to nestle with any time of any given day.